So after reading reviews about this book touting it as brilliant and hilarious, I decided it would be the first non-fantasy, non-history book I would read in a long while that wasn't required for class. The first part of the novel just dragged on and on. 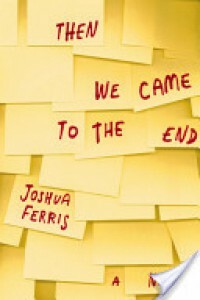 The author takes a unique narration POV: most of the story is told with the narrator being someone only defined as "we". You never get a real sense of who is telling the story and just how many people there are overall, since the "we" is never fully defined to be anything other than the people working at this ad agency. At first, it was interesting, but I like to have certain things in a novel defined for me, and this was something that continually frustrated me. Then there was the fact that this novel was supposed to be humorous. I didn't find anything that happened in it to be the slightest bit funny. Maybe there really are people out there like this, but I just couldn't imagine that all these people could be so horrible, especially in regards to the woman who's daughter was kidnapped and then killed. She was just someone they could gawk at and talk about, and not someone that should maybe be shown some compassion. The highlight and turning point of this novel that made me want to continue reading was the point at which the story of the partner, Lynn, was told. It was not in the "we" point of view, but told in a usual third person narrative. It was just so honest and so heartbreaking, reading about this woman who seemed so alone and when she really needed to have loved ones in her life, she was instead sick and left to be fighting cancer by herself. And then she was too afraid to fight it so she just kept putting it off. It was very real, the emotions were very palpable. So of course to me it meant that maybe we would start seeing something different. But then the novel went back to the voice it had before, except it seemed that things were a little more serious in tone than they were before. At this point I was just waiting for the end, and I like that the author left the fate of Joe Pope up in the air, while defining the lives of the other characters five years later. Though I'm not entirely certain that I understand what he meant in his last line when he wrote, "We were the only two left. Just the two of us, you and me." Because this threw in a whole lot more strangeness and it may seem to have defined the POV a little more, but just left me that much more confused. Overall, I guess this is a good novel, definitely for a debut work by this author. I just don't like stories that aren't in a fantastical, fictional world, so I guess I didn't connect to this novel as much as someone else might. Enjoyable if you like this brand of humor, but to me there was only that one highlight, the gem in the middle of the story from Lynn's POV.